Tania: We met in Jakarta, Indonesia at an event. We started dating in October 2015 after getting acquainted for approximately four months. A long-distance relationship (LDR) was inevitable as Ayron lived in Singapore while I was based in Jakarta. Both Ayron and I took time to visit each other every other month, since Jakarta and Singapore are only 1.5 hours away by plane. The LDR continued until I decided to pursue a further degree in Singapore a year later. In August 2016, I continued my studies in a public university in Singapore, taking a year-long Masters program in Technopreneurship. Making up for all the lost time, we then took the chance to deepen our understanding of the other and to travel together. Tania: After finishing my studies, I decided to pursue a career in Singapore and so, joined a local AI startup right after graduation. After more than two years, I felt that Ayron was ready to take on a more committed stance in our relationship. Indeed, he took the chance to pop the question during our Christmas vacation. Ever since we started dating, Christmas Eve is the time that we reserve for just the both of us. On 24 December 2017, Ayron prepared a little surprise for me in Hong Kong. I was not expecting Ayron to propose that night, although we have had prior discussions about getting married. He made a reservation at AVA Restaurant Slash Bar, an establishment located on the 28th floor of Hotel Panorama. This provided us a fantastic view of the bay and on top of that, he booked the corner seat to ensure us our privacy. For the last dish, a cake with “Will You Marry Me?” written on the plate was served. At this point, he went down on his knee and proposed. I said yes and the wedding preparations began! That Christmas we got to start calling each other fiancé and fiancée, making it an unforgettable vacation. On the wedding day, I had a few outfits as there was the holy matrimony ceremony in the morning, followed by tea ceremony in the afternoon, and then the dinner reception. I decided to have my dream wedding dress crafted from scratch with a designer from Jakarta, Indonesia. 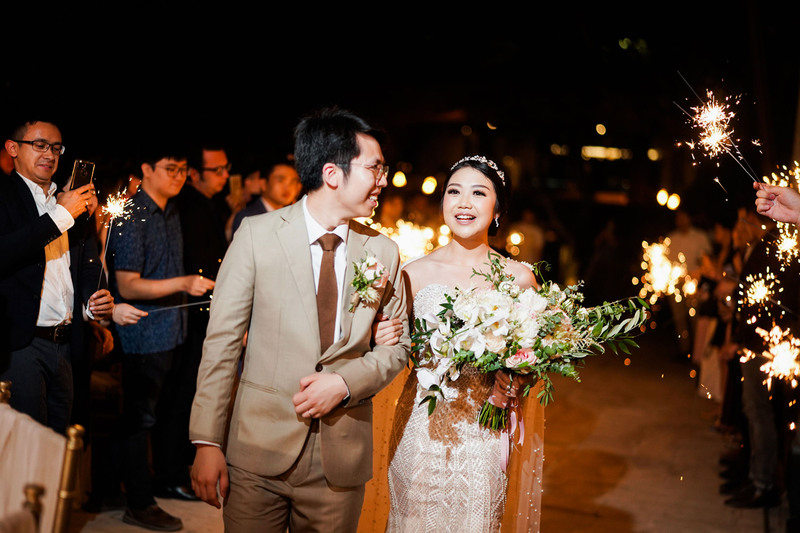 As the dress needed to be brought from Jakarta to Singapore, I chose to have a dress that could be altered into two looks that I wore to the morning ceremony as well as for the first march-in during dinner. I chose the mermaid dress for the church ceremony with a cape for a more feminine touch. The designer managed to turn the mermaid dress into a beautiful ball gown for the evening reception. I have always dreamed of wearing a ball gown on my wedding day, hence the creation of a ball gown for my second look. As I adore pearls, the dress had countless pearls combined with Swarovski that gave me the look of a glowing bride, especially during the first march-in. The beautiful venue, together with the gorgeous dress, made it an unforgettable night for Ayron and I. 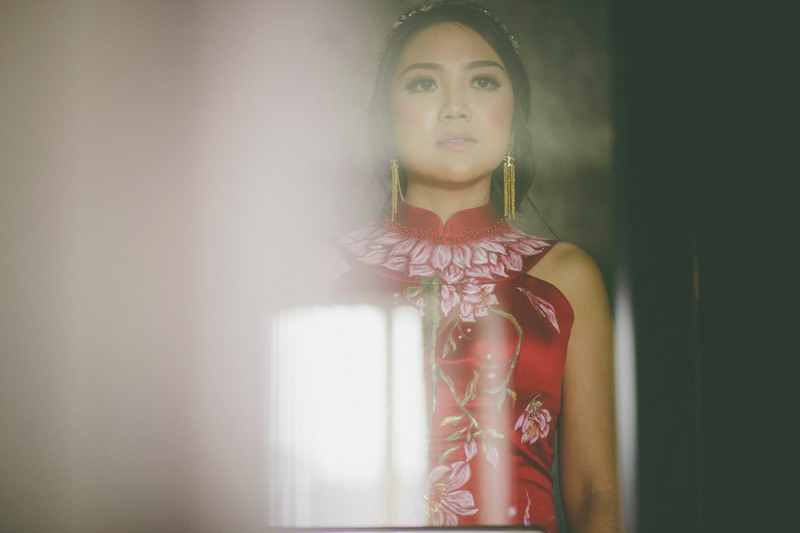 For the tea ceremony, I wore a modern cheongsam that was made by an Indonesian designer and hand- painted by a local artist. 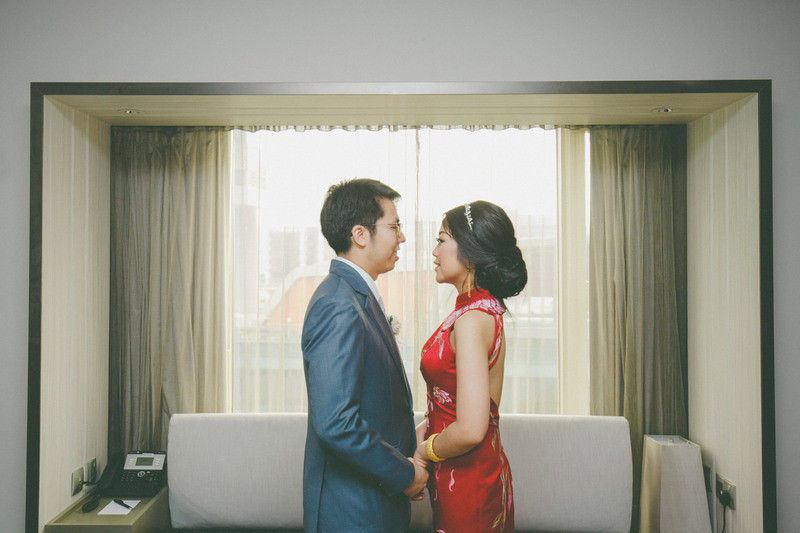 The red dress was definitely a showstopper since no one had seen a hand-painted dress! Apart from the painting, the mermaid dress had a backless finishing that made it even more stunning. I chose a dress from Coast for my second march-in and first dance. It was a metallic A-Line dress that fit me perfectly with no alterations required. 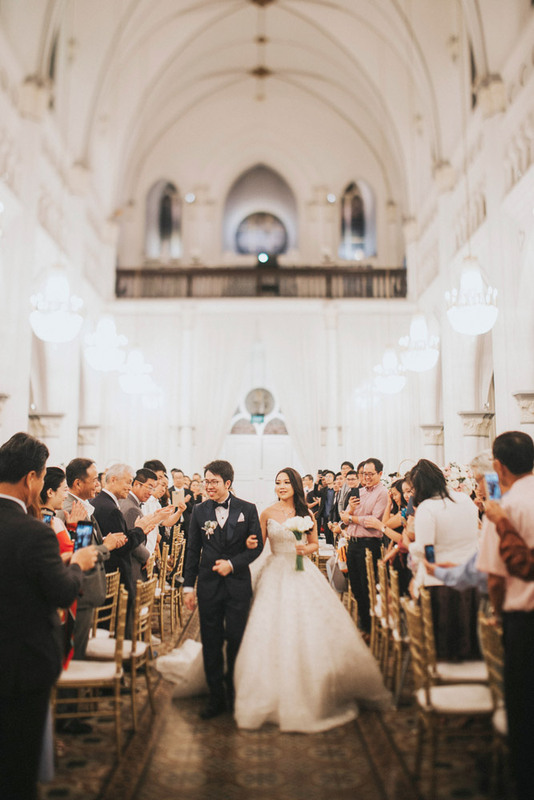 Tania: While discussing the wedding venue, Ayron and I agreed not to have our wedding at a hotel ballroom as we wanted to do something different from the typical wedding. After looking around, we finally decided that Chijmes Hall would be the perfect venue for us. Apart from its vintage and Victorian setting, we also liked the fact that we had options for either Chinese, fusion, or Western food. Since we both wanted to make our wedding unique, we decided to go with a fusion menu. We also broke away from tradition by having long tables setting. 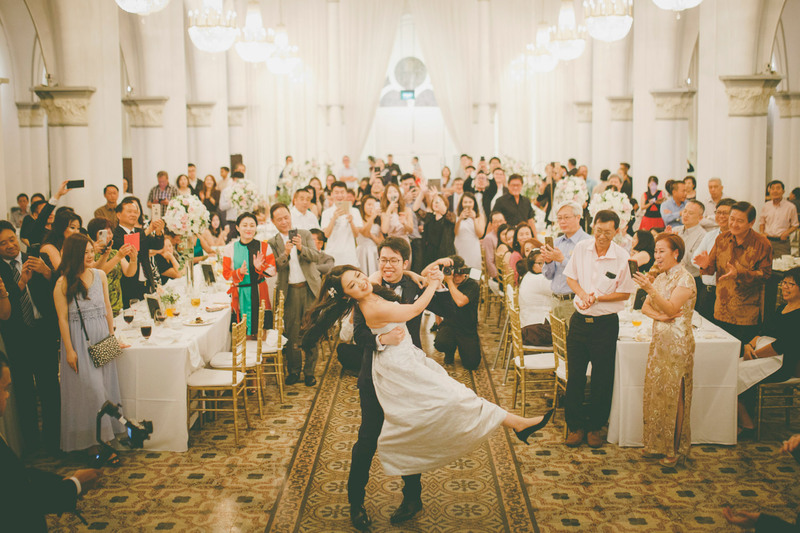 This is uncommon in Singaporean weddings, but we believed that it would create a different ambience for the guests, making it a memorable wedding. I asked the decorator to give it a softer touch, by adding some pastel pink flowers. 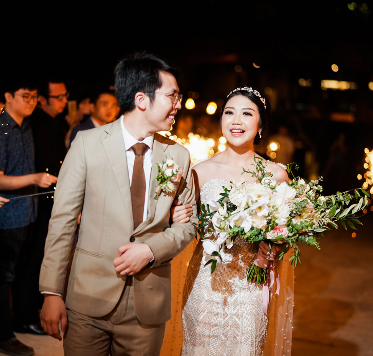 We had many guests flying in from other parts of the world such as Thailand, Indonesia, Germany and more, and they were awed by the intricate details in the decorations. 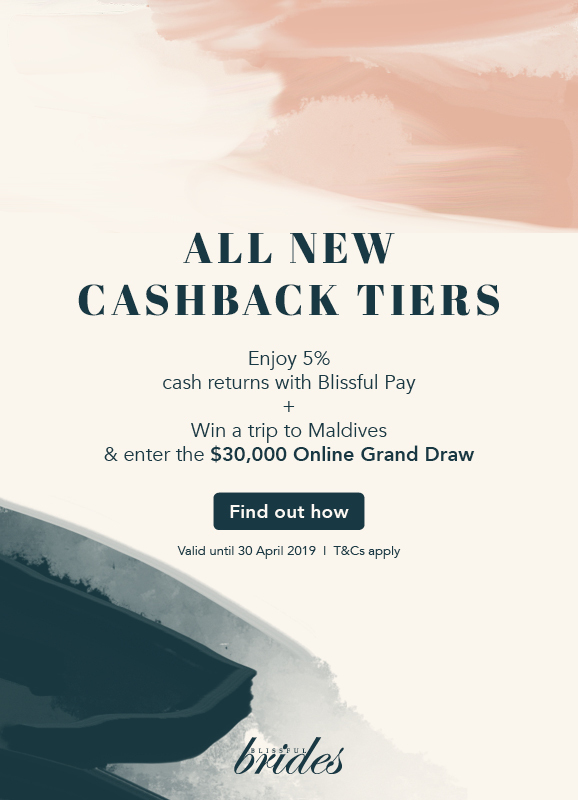 Everyone enjoyed themselves thoroughly and both of us would always remember how our hard work paid off when we saw the smiles on the guests’ faces. Tania: There are too many moments to share, but Ayron and I do have a few. For me, the holy matrimony at church was the most memorable moment. Being raised in a Catholic family has made church weddings sacred for me. When my father walked me down the aisle, it was a once in a lifetime moment that I will remember forever. When we vowed to love each other unconditionally for the rest of our lives was also a moment that was just as memorable. For Ayron, the highlight of the day was during our first dance as husband and wife. With the help of our good friends from “Our First Dance”, we had practiced our first dance for few months before the actual wedding day. After putting so much time and effort into learning from scratch, we really pulled it off by presenting an amazing first dance to everyone. Ayron: We could really see that everyone looked at us with a kind of awe, as they did not think that we would showcase a dance. It was a great learning process for us to understand how to dance, to connect with each other more through the dance, and also trust each other during the performance. It takes two to dance, and we have learned to become good dance partners, something we hope will be applicable to how we learn throughout our married life as well.